If a light bulb doesn’t come on when you turn the switch on, then there isn’t a complete circuit through the bulb. The question is why, and what can you do about it? The problem can be that the bulb is shot, or that the power isn’t getting to it, or that there’s something wrong with the electrical path back to the ground—the neutral wire. First of all, it doesn’t matter what kind of light bulb you’re dealing with. Incandescent, fluorescent (including CFLs), halogens and LEDs all work the same way. It doesn’t matter what shape it is either. The only slight difference is that some tubular lamps connect at both ends. And, as that implies, it doesn’t matter what kind of base it has: regular screw base or a GU10 bayonet base or two bi-pin ends. If it uses electricity to make light, it needs a complete circuit from the panel through the bulb to the neutral and back to the source. If that exists, the bulb should work. If any part of that circuit is damaged or missing, it won’t. 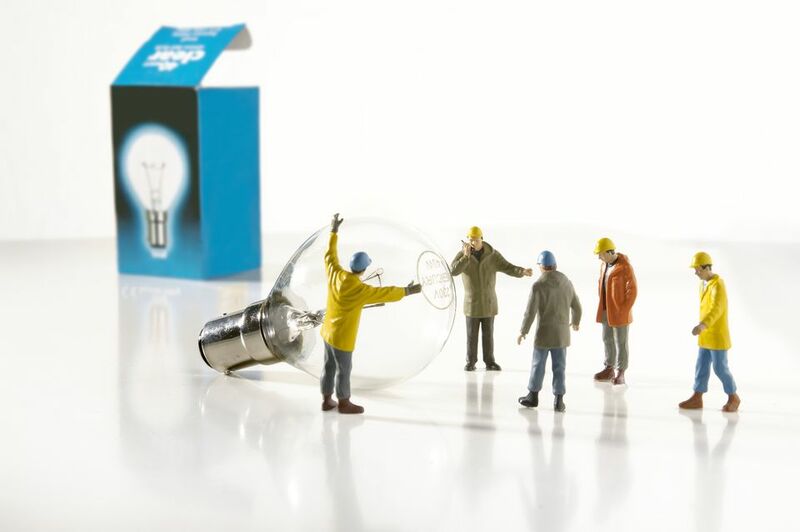 With a regular on/off the bulb, if you don’t know whether the bulb might still be good, you can test it by taking it out of the location where it isn’t working and installing it in a different location where the same kind of light bulb is working. To do that, you’ll have to handle at least one bulb that you know is good and one that you think might be. Assuming that you don’t want to shorten the life of those bulbs unnecessarily, remember to clean and cover your hands before you grab one, to avoid leaving fingerprints on it. Turn the working bulb off, take it out of the working socket, and set it aside. Take the bulb that’s not working out of its socket and put it in the working socket. Turn the socket back on. If the bulb doesn’t come on there, you can double-check by putting the working bulb in the socket that wasn’t working, but the likely answer is that you need to replace the bulb. If both bulbs work in the working socket, but neither one—or only one—works in the other socket, then there’s probably a problem with the socket where you noticed the light wasn’t coming on. With a 3-way bulb, if it isn’t working at all, it’s probably dead. You can test it by moving it to a working 3-way socket, but it’s very rare that both elements of a 3-way bulb will fail at the same time. But if part of it is coming on and the other part isn’t, the problem may be with the socket. Test that bulb by moving it to a working 3-way socket. If both elements don’t come on there, replace the bulb. If you have a 3-way bulb that works as it should in a good 3-way socket, and only one of the two elements works in a different socket, the problem is with the socket. Before moving on to work on the socket, note which part of the good 3-way bulb is working. A 3-way socket has four switch positions, and a 3-way bulb has two elements. One of those elements draws more power and produces more light than the other. Starting with the switch off, the first click turns the power to the lower-power element on. The next click turns that power off and turns the power on to the higher-power element. The third click adds the lower-power contact so that both elements are on at once, and the fourth click turns everything off. Let's use a 30-70-100W incandescent 3-way bulb as an example; the switch will power the 30W element first, then the 70W element, and then both, giving you the 100W maximum. If your bulb goes on-on-off-off as you turn the switch and it’s putting out a decent amount of light when it’s on, then it’s not getting power to the lower-power element and only the higher-power element—the 70W element in the example—is coming on. It can result from a common form of damage to the socket. If the bulb is going on-off-on-off, then it’s not getting power to the higher-power element. In the same example, it’s the 30W element that’s being turned on and off when you see this.